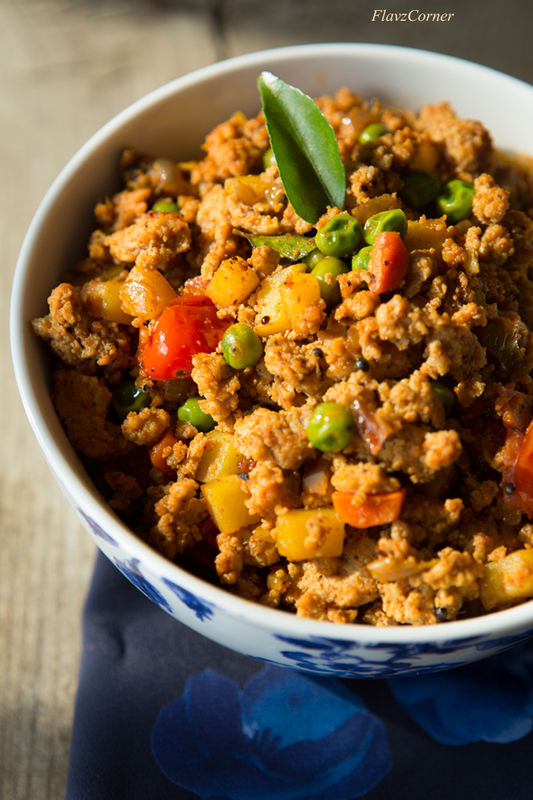 Keema is an Indian dish that uses ground meat with vegetables cooked in a blend of spices. Most of the time mutton/goat meat is used in this dish with peas. Traditionally, the first step was to cook the meat with pepper and salt and its minced and slowly cooked with spices and vegetables. But this dish has evolved and attained a easy reliable label over the years due to the availability of ground meat in the market. You can use ground beef, lamb, veal, turkey, chicken etc to make this dish with your favorite vegetables. 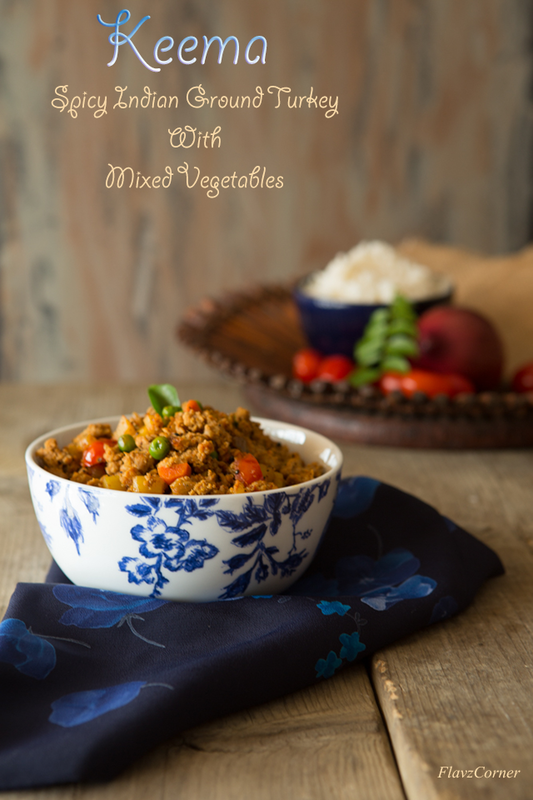 I make Keema with turkey meat and mixed vegetables. Making Keema is not that hard. You can serve them with Roti (Indian flat bead) or rice and yogurt. Keema is so versatile. They can be used as fillings in Quesadilla or in savory treats those are made with puff pastry or Filo sheets. This is how I make Keema that fits my family's palate. The first step is to make Tadka. We will be using the same pan for rest of the cooking. In a medium non stick deep pan, heat 2 tsp of oil. Splutter the mustard seeds and add sliced shallots and freshly crushed black pepper. Saute till the shallots/onions get light golden yellow. Turn off the flame and add the curry leaves. Transfer the tadka to a small bowl. In the same pan add 2 tsp of oil and cook the ginger garlic paste till the raw smell goes. Now add the ground pepper and turmeric powder and cook for 20 seconds. Add ground meat and salt and stir well. Cover and cook till there is no meat and all the water is evaporated. You can stir in between to crumble the meat or you can crumble it once it is cooked well. Transfer the cooked meat in to a bowl. Wipe the pan with a paper towel. Saute the chopped onions with salt in 2 tsp of oil. Add chili powder, coriander powder, asafoetida (if using) and garam masala and cook till the raw smell is gone. Add the chopped tomatoes and cook for another minute. Now add the mixed vegetables;saute; and cook it covered for 5 minutes with 1/2 cup water. Its time to add the cooked meat to the vegetable mix and adjust the salt. Mix everything well and cover and cook for 5 to 8 minutes. Mix the tadka to the prepared Keema and turn off the flame. Serve the Keema with Roti or Rice and yogurt. You can use any vegetables or frozen mixed vegetables. I usually use potatoes, carrots and peas. 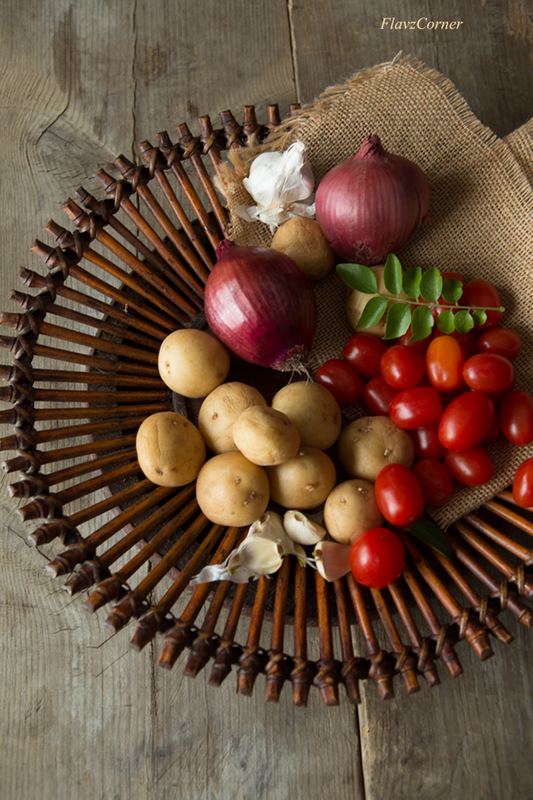 If using fresh vegetables make sure that they are cut into same size for even cooking. You can use 1 tbsp of tomato paste instead of chopped tomatoes in this dish. Adjust the amount of spice according to your taste. Left overs can be refrigerated or you can freeze the Keema to use as a stuffing in puff pastry or Quesadillas. 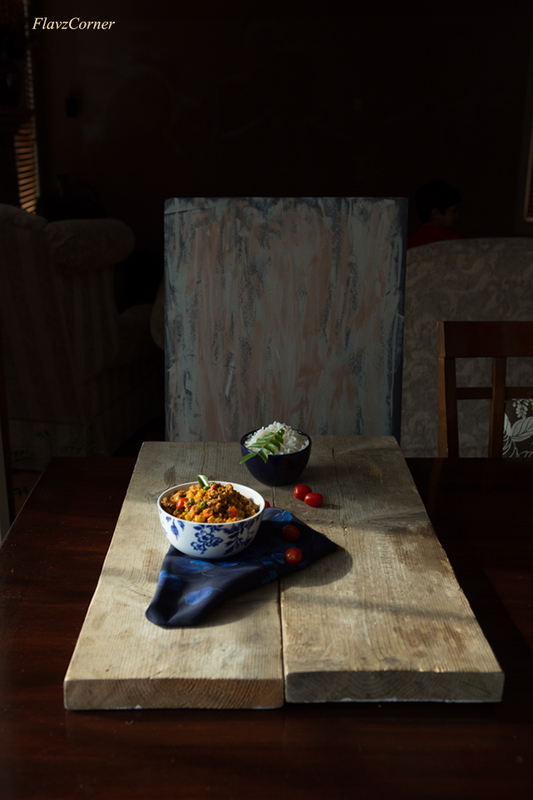 Shibi, I really liked the set up picture the most, it looks like a rustic kitchen in old paintings with beautiful light..adipoli keema. wow..looks delicious filling,I try a similar version with soya granules..but with meat I haven't so far, and now got to wait till lent is over,Shibi..scrumptious !! I never tried miced turkey..I m not a fan of turkey, maybe becoz I didnt try it the Indian way...the keema with all masalas sounds tasty..I liked your set up. Looks very delicious, sound like my family will enjoy this dish. A very delicious homey keema! It would be great as the bread filling too. I'm with those that liked your set up picture -- and adore that light! And you bet I'd adore your keema, too. Love the stuff. Need something really spicy today to ward off the cold and snow. Beautiful clicks Shibi. I am swooning over this keema. I usually serve it with rice but at times we polish it off with toasted Pav bread. Just saw this somewhere else and Im glad I did. Very nice pictures. I love how you showed your props. Kheema is great with turkey. Keema looks delicious Love it with ground turkey. My kids loved this recipe I made with ground turkey. The photos are beautiful and capture your essence. Thank You!